The 2009 Drum Corps International Tour is winding up into the last few weeks of the season, while corps continue to travel the country, presenting their breathtaking shows at more than 100 events in nearly 40 states. Whether long-time supporters or first-timers, no DCI event would be complete without the excited and sometimes eccentric fans from around the country who come out to support their favorite corps. Don't miss a second of the exciting action from the world's most elite marching music ensembles—join these extraordinary fans at the next DCI event near you! View the complete 2009 DCI tour schedule. 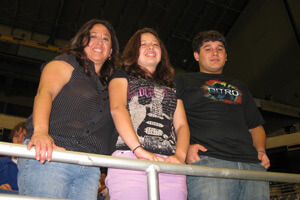 These fans attended the DCI Southwestern Championship at the Alamodome in San Antonio, Texas on July 18. After being introduced to the drum corps activity in 2002 by a friend's son, Diane and Charles McCullough of Crete, Ill., decided they wanted to help out, but in a personal way. "I saw how hard these kids worked to be a part of this, and then when I found out they had to pay to work that hard, that was just more impressive," Charles said. The couple, who have also been part of the Friends of DCI program for three years, support individual corps members each year. This year they are sponsoring a member of Phantom Regiment and another in Carolina Crown. "What fascinates me as much as anything is knowing the amount of work they put in, what they get out of it outside of the performance, and what they get when they leave drum corps. The experience, the maturity…it's something you can't get anywhere else," Charles said. Christina Duxbury, who marched as a member of the Blue Devils last summer, brought Pam and Lauren Donahoo and other high school friends out to the Alamodome. Christina is from Fort Worth, Texas, and had already seen the Blue Devils' show at the DCI Dallas event earlier in the week, but was very eager to see it again. "I love their show. I wish I was there," she said. "I'm excited to see all my friends again." 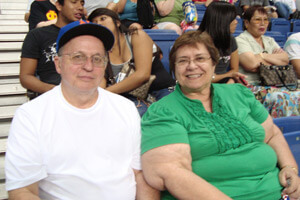 Gary and Marilyn Hardy, originally from Attica, N.Y., used to attend drum corps competitions quite often in New York but hadn't seen the corps in awhile. A small drum corps used to be based near their home, which got them involved in watching the activity, and they enjoy seeing how things change over the years. "It's a lot more complicated than it used to be. It was more military back then," Marilyn said, adding that corps had a specific way they had to get off the field. "It used to be fun because if they didn't get off in time they lost points. It was suspenseful—are they going to finish in time? Are they going to get off in time?" Niki Reinhard (third from left) Joshua Roman (third from right) and their friends are high school marching band students from Tom C. Clark High School in San Antonio. They heard about drum corps from their band director a few years ago and came back this year because they love to watch the corps perform. "One of our friends is marching as a member of Revolution so I came to see her, and to see Santa Clara Vanguard. I like them a lot, and I'm going to try out for them next year," Joshua said. Stephanie Chambless, with Marissa and Austin, learned about the DCI Southwestern Championship in their hometown of San Antonio through Marissa and Austin's band directors. "Their directors recommended that they come to this show to observe and learn from the experience," Stephanie said. Marissa is in the band at Southwest High School in San Antonio. 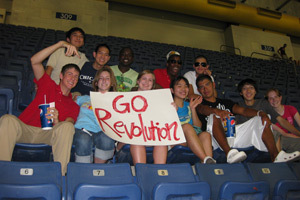 "I'm a section leader, so I thought it would be a good experience to come watch good groups play," she said. 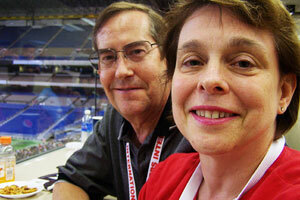 She and Austin, who is also a section leader, were both experiencing their first drum corps show on Saturday. 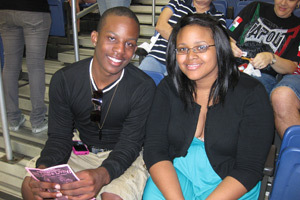 Marcus Wheat and girlfriend Ashley Lee came out to the Alamodome from Houston, Texas. "I wanted to see some of my friends perform and enjoy the show," said Marcus, who marched as a member of Revolution for two years as a trumpet player.